Jewish Lights Publishing, 9781683367055, 240pp. Presented in the form of letters from a rabbi to his sons, Why Judaism Matters is common sense guidance and a road map for a new generation of young men and women who find Jewish orthodoxy, tradition, issues, and beliefs impenetrable in 21st Century society. 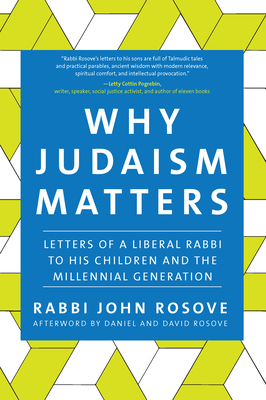 By intimately illustrating how the tenets of Judaism still apply in our modern world, Rabbi John Rosove gives heartfelt direction to the sons and daughters of reform Jews everywhere.